Selecting the right media to use for backups depends on budget, how much data there is and the networking operating software. External hard disks or a NAS box with cloud backup may provide a good solution. 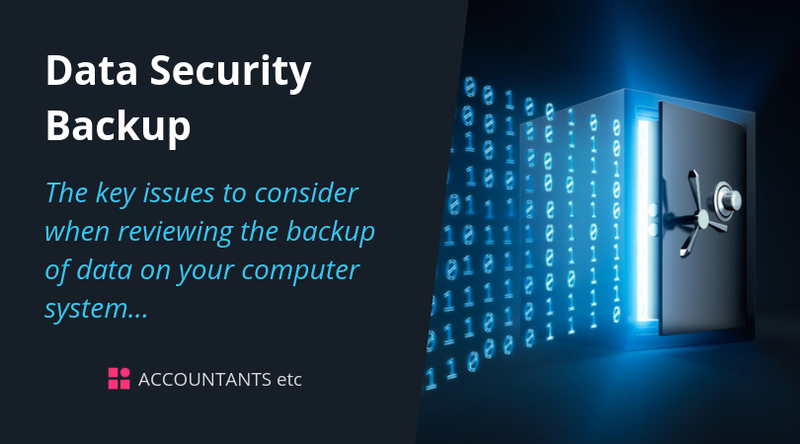 If an external service provider is used, or perhaps a cloud option, they should have their own backup regime – but don’t totally rely on this. Many internet service providers and third-party IT service organisations, now offer, either as standard or as a chargeable extra, off-site data repositories and also complete online application solutions. The immediate appeal is that there is no need to internally support a server and its operating and applications software. However, there are a significant number of key security issues which should be covered as part of the contract/service level agreement (SLA). These should include level of encryption, the countries in which the data is processed and stored (as this has potential issues with Data Protection laws), data deletion and retention periods, the availability of audit trails of who is accessing the data and finally, who has ownership of the data if the provider goes into administration/receivership. Please do contact us if we can be of further help.